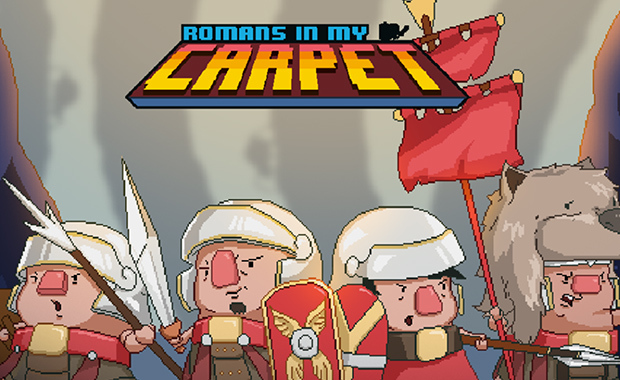 Romans in my Carpet is a game that feels like it should have been released as an early access game on Steam. The look and feel of the game is similar to those being pushed out by hopefuls who just want to get their great idea out the door and maybe sell a copy or two. 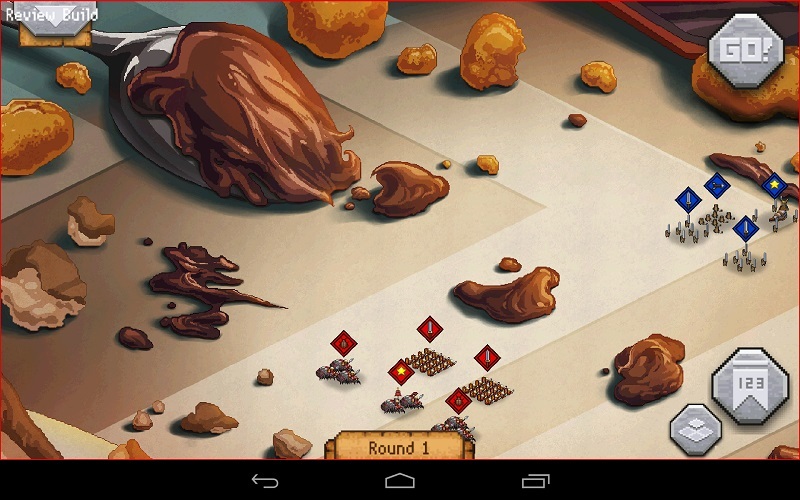 However, this game was instead designed as a mobile game for both iOS and Android. While the mobile aspect probably helps this title, it feels like it could be so much more. 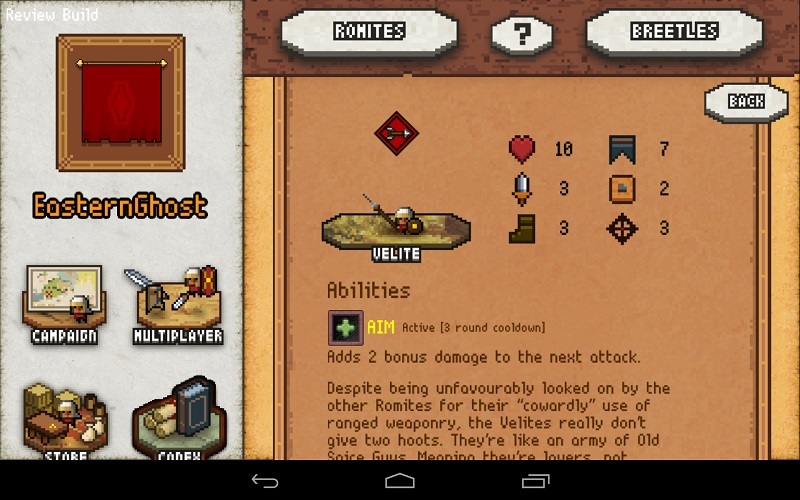 Romans in my Carpet is a turn based strategy themed around tiny vermin that are Romans and Picts (or Celts, it’s a bit hard to tell) for some reason. The campaign begins with the Romites (Roman Mites) who are setting out to conquer an entire room. The unit names are similarly combinations of actual Roman infantry types with the word mite. With all this going on, one wonders why they didn’t try to make a Pax Romana pun at some point. 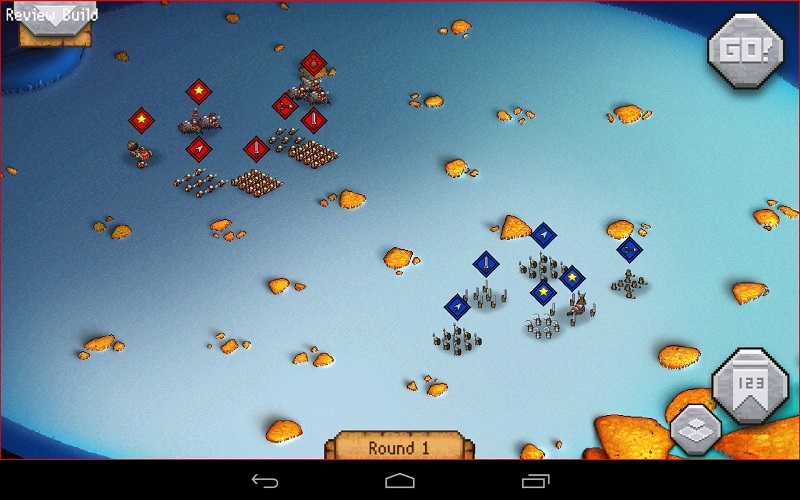 As a turn-based strategy game, there is the usual rock-paper-scissors mechanic of comparing the strengths and weaknesses of units. Pikes are strong against cavalry, cavalry are strong against ranged attacks, etc. It isn’t anything new, but it is a system familiar to most gamers and is easy for casual players to pick up. Starting Romans in my Carpet takes you straight into the tutorial, which explains the mechanics of the game over basic scenarios. It is about this time when you will discover the biggest issue that exists with this game: always-online DRM. Players are required to have an available data connection in order to execute commands given to units. The developer has explained that this is an anti-cheating measure for multiplayer. While it definitely should prevent people from hacking the game to their own advantage, it also makes it impossible to play the game away from the internet. Always-online DRM is a filthy word for gamers, and this sort of thing really shouldn’t be happening anymore. Witching Hour Studios, you do not want to be Ubisoft. As far as actual gameplay goes, Romans in my Carpet makes a solid attempt at providing a variety of different battlefields to contest. The themes vary across the campaign, with armies meeting on Dungeons & Dragons tables, bookshelves, and even the carpet. The maps are extremely colourful and are quite a bit of fun to look around to see what the developers have decided to throw in to give the game more character. That being said, the actual tactical use of the maps is rather limited. It looks pretty, but the terrain rarely offers the opportunity to be used in tactical way. Most battlefields are mainly large open spaces with pretty objects around the edges. This ends up with most battles turning into two armies charging into each other and hoping for the best. Fortunately, there is a bit of tactical gameplay involved in the game. This stems from the sort of initiative system implemented. Players issue their orders at the same time during the Command Phase; once this is done, units begin to execute those orders according to their initiative rating. Positioning becomes extremely important as some units may end up tripping over each other. It offers a reasonable amount of depth to a game that otherwise lacks anything else to provide a challenge to the player. Some may find the writing in Romans in my Carpet to be quirky and amusing, although it tries a little too hard at times to be funny. There are parts where the humour sounds a little forced, although this is a minor issue with attempts at finding humour. Despite the idea of the game is already rather surreal and would have benefited from the developers playing it straight. The campaign could have benefitted from being a little longer, although it isn’t a problem as the developers have included a multiplayer option to provide a little extra longevity to the title. It isn’t all that spectacular as a multiplayer title, and turns can take a longer than would be pleasant as a pickup game. The asynchronous aspect of the multiplayer helps due to the turn-based nature of the game, but it would be better to challenge friends instead of using the matchmaking service. 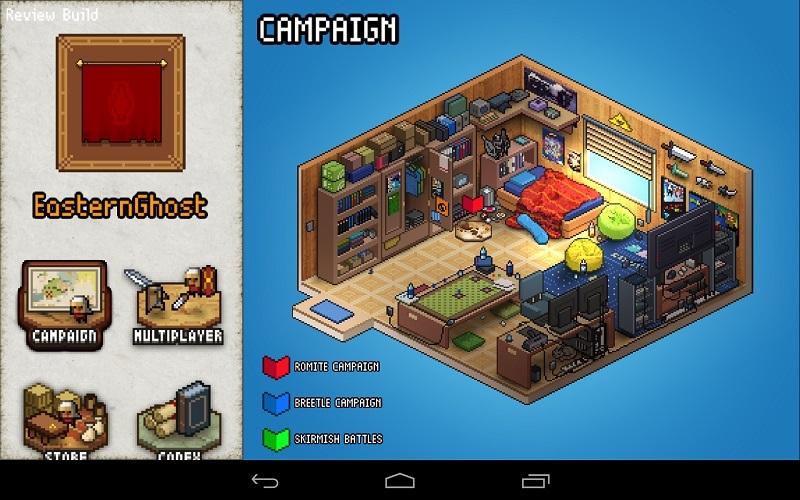 Overall, Romans in my Carpet is a decent mobile game for its price. The lack of free-to-play elements in the game provide a very positive experience in an environment that is constantly trying to get you to reach for your wallet. 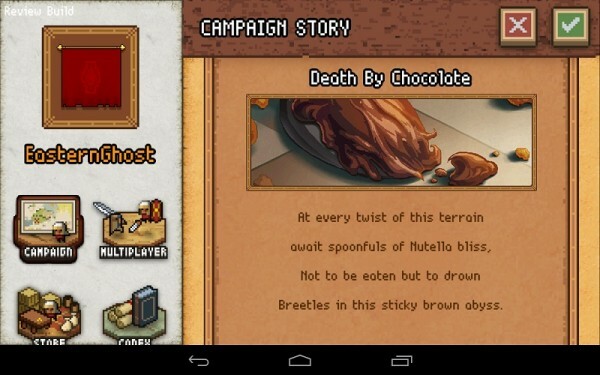 If Witching Hour Studios removes the DRM, this might be something to recommend to friends. Romans in my Carpet is developed by Witching Hour Studios and available for both iOS and Android for US$2.99 (RM10).